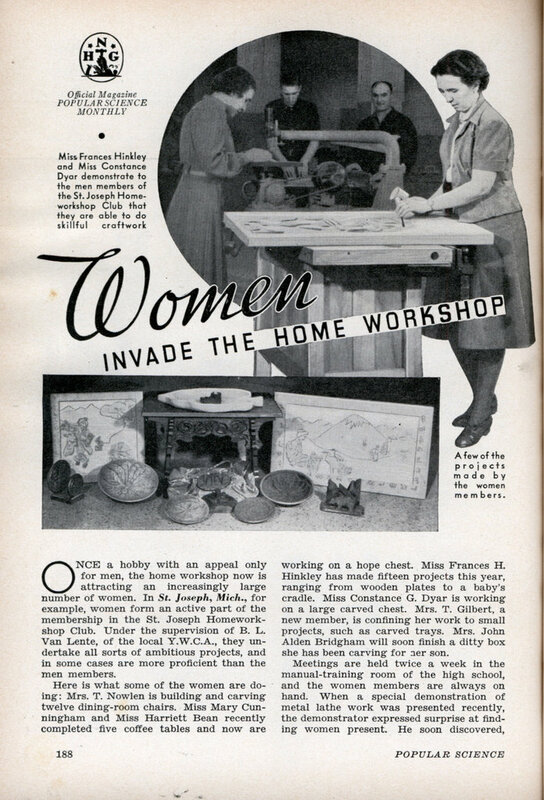 ONCE a hobby with an appeal only for men, the home workshop now is attracting an increasingly large number of women. In St. Joseph, Mich., for example, women form an active part of the membership in the St. Joseph Homework-shop Club. 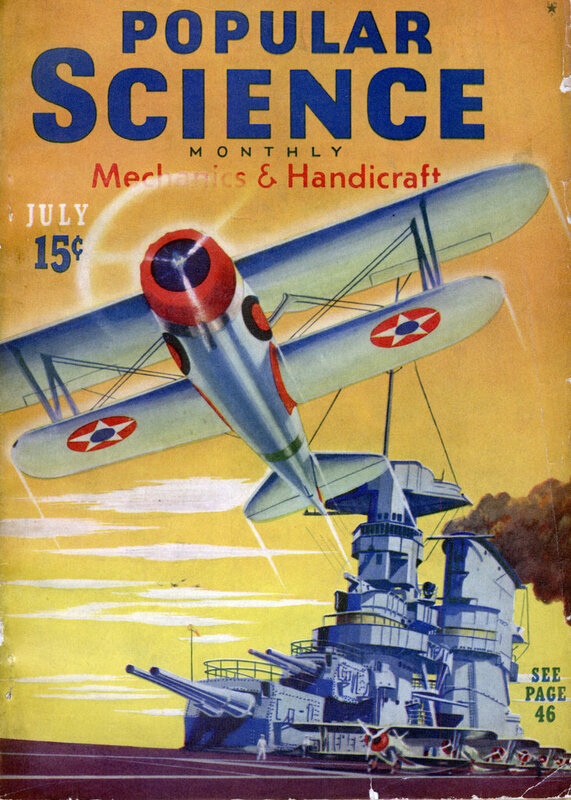 Under the supervision of B. L. Van Lente, of the local Y.W.C.A., they undertake all sorts of ambitious projects, and in some cases are more proficient than the men members. Here is what some of the women are doing: Mrs. T. Nowlen is building and carving twelve dining-room chairs. Miss Mary Cunningham and Miss Harriett Bean recently completed five coffee tables and now are working on a hope chest. Miss Frances H. Hinkley has made fifteen projects this year, ranging from wooden plates to a baby’s cradle. Miss Constance G. Dyar is working on a large carved chest. Mrs. T. Gilbert, a new member, is confining her work to small projects, such as carved trays. Mrs. John Alden Bridgham will soon finish a ditty box she has been carving for her son. Meetings are held twice a week in the manual-training room of the high school, and the women members are always on hand. When a special demonstration of metal lathe work was presented recently, the demonstrator expressed surprise at finding women present. He soon discovered, however, that they were not merely curious onlookers. Among the new clubs affiliated with the National Homeworkshop Guild, one of the most ambitious is the Grant Park Woodcraft Club, South Milwaukee, Wisc. Within a month after its organization, the members had obtained a large room and equipped it with six workbenches and a large assortment of hand and power tools. The members feel that by pooling their assets they can accomplish much more. The Community Homeworkshop Club, Natrona, Pa., is another new group that has set up a club workshop. Three power tools have been purchased and local merchants have donated $40 worth of hand tools. G. A. Covert exhibited his shop and things he had made when the Portsmouth (Va.) Homecraft Club met at his home … A new cut-off saw was demonstrated to the Homecraft Club of Pittsburgh, Pa., at a meeting in a local hardware store . . . Louis Sakosky demonstrated metal spinning before the Gem City Homeworkshop Club, Dayton, Ohio, at the shop of M. H. Leander. Theodore Herbert won the club contest for the best constructed project made in recent months . . . The Seattle (Wash.) Homeworkshop Club held open house when the remodeled club-room was completed recently . . . Fifty combination reading and bed tables are being made by the Covington (Ky.) Homework-shop Guild for presentation to hospitals. Among the civic minded clubs of the Guild, the Orchard Park Home-Work Club, West Lynn, Mass., is one of the most active. During the past year the placement bureau found work for several hundred persons, 277 toys were repaired and given to poor children, 110 clothing articles repaired, and many dinners given to poor families. The Timbercraft Homework-shop Club entered the New Bedford (Mass.) Hobby Show and won sixteen prizes. Charles Jeglinski received a trophy awarded for the best project.